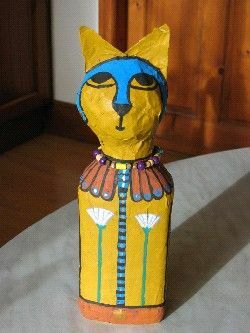 Make Ancient Egyptian Cat door stops out of recycled materials with Janet Dyer. Plus learn about the history of the Egyptians and their belief in the After Life. All materials included and there will be breaks for lunch and snacks. Please note that this will be a messy workshop and copydex will be used so we advise that old clothing is worn. Please note food will not be provided at any workshops at PAD so we advise that participants bring a packed lunch. Breaks will occur throughout all the workshops for your comfort.